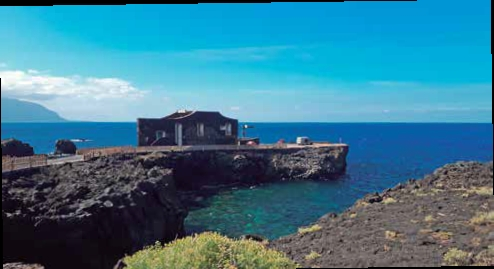 On February 20 we're going to El Hierro! Everyone knows where the island is, but only a few have visited it. Digasports offers readers the opportunity to explore the smallest island in the province of Tenerife. We will meet at 7.15am at the Naviera Armas counter at the Los Cristianos port. Travellers also have the opportunity to take advantage of a transfer from Puerto de Santiago to Los Cristianos. At the moment we do not offer transfers from the north. The Digasports staff will welcome the readers and hand over their boarding passes. The ferry leaves at 7.45am. Dolphins and harbour porpoises can often be observed on the crossing, and those who want to enjoy the fresh morning breeze on the upper deck should not forget to dress warmly. You'll need a good windproof jacket as the cool wind can be quite chilling. The crossing takes about two hours and the ferry will arrive at Estaca in the harbour below Valverde, the capital of El Hierro. The bus will make its way up the zig-zagging roads to Valverde, stopping at Mirador Isora. The spectacular panorama of the steep cliffs and La Playa valley will more than compensate for the effort of the ascent. We will continue over the ridge towards the north to the next viewpoint at Jinama, where we will stop again. The short drive to Jinama is a tough one, the road runs over the ridge and this is one of the few places in the world where a traveller can see the coast and the sea on both sides. From El Golfo we will continue to the local economic centre La Frontera and Las Puntas. The smallest hotel in the world is said to be located here. There is a dispute about that, but it only has four rooms. At the restaurant La Pasada, a tempting buffet to satisfy the palate and different tapas will be served. On the way back to the harbour, we will invite you to take a break at another vantage point, the Mirador de La Peña. Here everyone who fancies a sweet treat can try a Quesadilla in the bakery. This dessert made of cream cheese and many other secret ingredients is one of the island's most successful exports. In the harbour the Naviera Armas ferry will be waiting for us, and it will be time to bid farewell to El Hierro and head back to Tenerife. At 8pm we will dock in Los Cristianos, richer for the experience of having visited this small but beautiful island. The excursion price of €99 includes the ferry crossing, the bus journey, food and beverages. A bus transfer is available from Puerto de Santiago to the port and back in the evening. Reservations can be made by phone, internet or directly at the Digasports office at Park Club Europe in Playa de las Américas. Customers can pay by credit card at Digasports or in cash at the ferry counter. For a firm reservation, your full name and NIE number must be given. If you can't make it on February 20, the tour will be repeated on March 6. Reservations: info.digasports@gmail.com or by phone on 677 48 99 46. Produced with news.CMS in 0,7441 seconds.